The John Muir Trust own/manage all or part of the countryside in this area and are commited to the conservation of wild places. You can support them by joining the trust or donating to their latest appeals or by spreading awareness. Latest Appeal: The John Muir Trust assisted the Lochinver community (Assynt Foundation) to purchase the outstanding 44,500 acres of Assynt and Drumrunie Estates including the iconic mountains Suilven, Canisp, Cul Mor and Cul Beag. The land will now be safeguarded as a national treasure, creating lasting benefit for generations to come. In addition to having four SSSI's, a special area of conservation and a special protection area for breeding birds the area was awarded European Geopark status in recognition of its outstanding geology and landscape. Not only is Ben Nevis the highest mountain in Britain, it is probably the most climbed, too. It is certainly the most popular mountain in Scotland. Located just outside Fort William on the west coast The Ben looks like a huge benevolent lump of rock... and it is: it hasn't directly killed anyone! However, hundreds of climbers, walkers, idiots and tourists have either died or had accidents on the mountain. The local Mountain Rescue team are usually kept extremely busy in both summer and winter due to the number of accidents that happen either on the cliffs of the plateau. Click here for a map/diagram of the summit plateau. The highest mountain, a munro to tick off a list... and, if the weather decides to be on your side a spectacular day out. If the weather isn't awful (check before you go) then it's a warm (or cold) welcome to heaven! The cliffs of Ben Nevis are a massive 600m high in places and have every type of climbing you could wish for. Since there are so many routes I'll just touch on a few here... that's not to say that I have climbed all of them... I'd like to though! When you get into this corrie in the summer you'll be amazed at how much rock there is. It's overwhelming, and if you're of a nervous disposition it can be very intimidating! I would stringly advise anyone climbing here (who isn't going to do on of the classic ridges) to invest in a good guidebook! This is a magnificent route for anyone who has a head for heights and enjoys a bit of exposure. The routes starts near the CIC Hut at the unmissable Douglas Boulder. The route has loads of history behind it (if you're into that) and you will immediately understand why once you get on it. This has to be one of the best days out on the mountain, although we soloed it in less than 2 hours in summer. Give yourself about 6 hours if you plan on belaying! A complete ascent should include climbing the boulder although most parties go up the east gully to the Douglas Gap. From here you climb and interesting (if short) chimney pitch before getting started on the ridge proper. The main obstacles on the ridge are the two 'towers' (a little one and a big one!) and the infamous Tower Gap. There is as much exposure as you can handle and the situations you find yourself in are just terrific. My first two ascents of the ridge still number amongst my most enjoyable days in the mountains. If ever a climb had a suitable name, this is it! A long climb, often with long runouts with no gear (unless you are really observant). This route goes straight up the Orion Face and through The Basin which can often still be full of snow in July. If your confident climbing multi-pitch routes in the lower grades, this is a great route to tackle on a sunny day if you want something a little more challenging. Speak to someone with 1st-hand experience of the route as route-finding might not be straight forward. Don't climb it when it's wet (unless you're a maniac). Rockfall - KEEP YOUR HELMET ON! 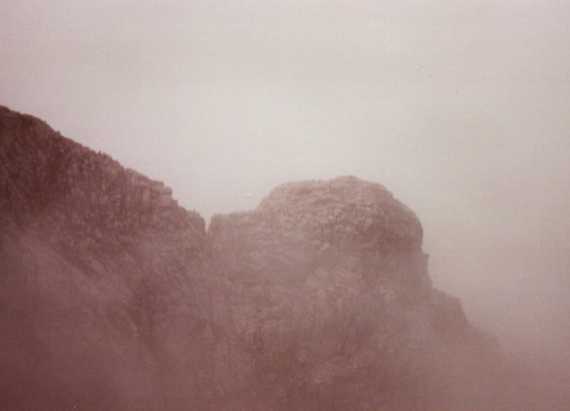 This was on of the first extreme routes on the mountain, first climbed by Robin Smith & Dougal Haston. The route is situated on the Carn Dearg butress and goes straight up some obvious overlaps and through the roof. I've not climbed it myself but it's meant to be a great route. Reputedly there's a peg just under the first roof for gear (I don't know how safe it is though). If anyone knows more, please let me know. Wow!... That might be the first thing you say when you see the cliffs dripping in ice! The gullies are quite reliable most of the time although they can have absolutely massive cornices at the top. It's always best to try and check this before you set out... tunnelling through wet cement might not be much fun after a long day! The avalanche forcast usually gives a good indication of where the climbing will be good. While this route might be a dawdle for you in summer it certainly won't feel anything like that in winter! 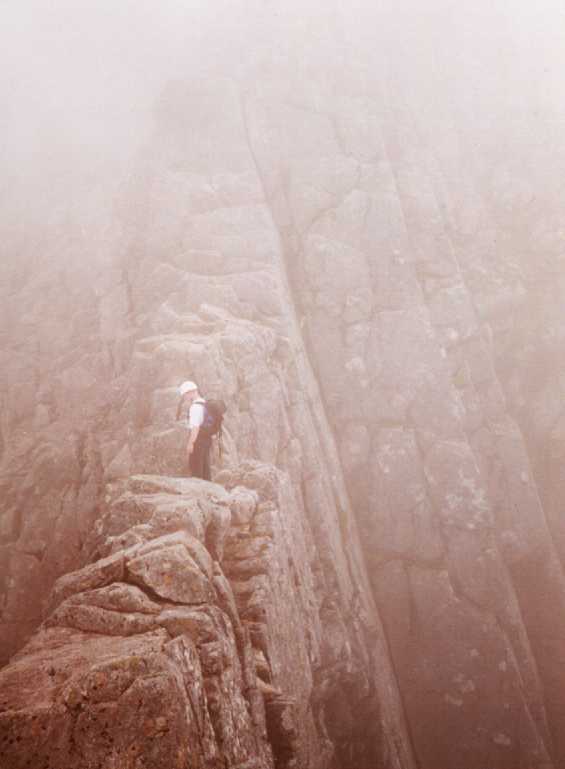 Ledge Route is described as The best grade II on the mountain in some of the guides. It's easy to see why. Normally an ascent route it can also be descended in summer (easy scramble) or winter should the situation dictate. The routes starts at the bottom of No. 5 Gully and ends on the summit of Carn Dearg. Head for No. 5 Gully from the CIC Hut. and once it becomes a proper gully (cliffs on both sides) you should see a 'slopey-shelf' leading off and up to the right. This is the start. Climb this and then traverse around to the right. This leads to a ledge/shelft above the first pitch of The Curtain which you would see on the walk-in. From here, a gully leads up and left... climb it! Depending on snow conditions, things get a little hazy about here. The guidebook suggests that you do a long traverse and then you're on the ridge proper which you follow to the top. We ended up climbing a further 3 pitches all of which were 50m and all of which had no runners (but you shouldn't fall off, should you?). If you're lucky there will be some nice ice-pitches which you can climb, too, raising the grade to III. Route finding isn't really a problem (unless you step off the cliff) and loads of variations are possible... just REMEMBER YOUR DEADMAN (or two). However, just because you have climbed a single pitch grave V in the Cairngorms, don't think you're qualified to climb this baby! Go with someone who has experience climbing routes like this... if you don't know anyone but want to climb it anyway, consider hiring a guide for the occasion (you can still lead!). This follows (more or less) the line of The Long Climb. It's a monster and probably not for the faint hearted! It looks like an amazing climb from the photos you see but there was no ice on it when we visited in February, this year (huge thaw). The 'obvious' curtain/sheet of ice on the left-hand side of the Carn Dearg butress before entering No 5 Gully proper. I don't think that anyone has ever climbed all the way up that tourist track just to boulder! Saying that, there is huge potential for bouldering here although most of the actual bouldering is probably only done on the Luncheon Stone - a huge boulder where lots of people stop to have their lunch! You can't miss it (in daylight) - it's on the right-hand side of the path (from the tourist track) shortly after you pass Castle Ridge. There are no access issues on the mountiain itself, however, please take care not to annoy anyone if you decide to get to the corrie by crossing the Golf Course! High Camping is Ok anywhere on the mountain although you need to be careful if you're going to camp close to the CIC Hut. Don't pitch your tent on/near anything that looks like toilet roll! Low Camping is only likely to be acceptable if you are on a campsite! The Ben Nevis (original) campsite is quite good. It is, however, closed in the winter which makes a lot of people decide to camp near their cars. Most of the land is private and is littered with NO CAMPING signs. Please respect these. It's OK to camp on the other side of the river (where the path goes up the mountain). Fort William is easy to get to from both North and South... it is very well sign-posted. From Fort William, follow the GLEN NEVIS signs. Thanks to Andy Ross for correcting my directions! Follow the A86 directly down loch-ness side and the great Glen to Fort William. It's some 65 scenic miles. Turn 1st left at the first roundabout in Fort William and you're in Glen-Nevis. The walkers path begins at Auchintee, some 3 or so miles along the Glen Nevis road. Fort William has everything you need.